My Wine of the Month for January 2018 is L’Avenir Estate Single Block 02 Pinotage 2014. 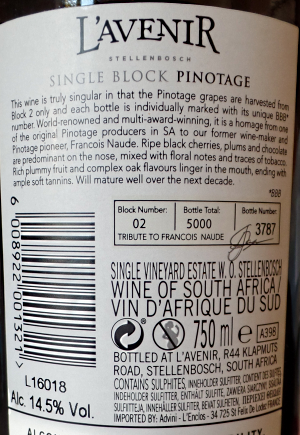 It is a registered Single Vineyard Estate Wine of Origin Stellenbosch, and Block 02 is pictured in gold on the label on an image taken from a satellite photo. The block was planted by François Naudé in 1985 as bush vines, but subsequently changed to low trellising. I brought several bottles of this wine home from the Cape last year and used two in premium tastings in London where they showed well. But this one I savoured at home with a Sunday roast. It’s truly gorgeous, with rich restrained berry fruits caressed by tannins from malolactic fermentation in first and second fill French oak barrels followed by 18 months in barrels, and stainless steel. There’s a purity of flavour, precise powerful and linear yet with that cheeky Pinotage varietal sweetness always present. It was a Pinotage Top 10 Winner in 2016 and also won Gold and the Stellenbosch Pinotage Trophy at the International Wine Challenge the same year.